I had a bag of frozen broccoli in my freezer that I was determine to do something with. I simply typed in the word “broccoli” into pinterest and a non-vegan version of this recipe appeared. 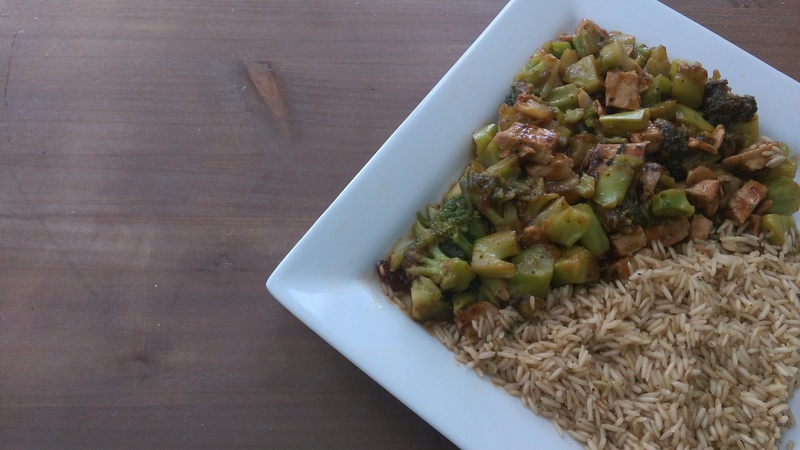 I swapped out the ingredients to make it more vegan friendly and added brown rice. It was quick, simple, and delicious – my favorite kind of dish! If you make this recipe, be sure to snap a photo and hashtag it #VeggieCurls. I’d love to see what you created! Heat 1 tablespoon oil in a large saute pan over medium-high heat. Add chicken strips, and season with a generous pinch of salt and pepper. Cook for about 3 minutes, stirring half-way through, until the chicken is browned and mostly cooked through. While the chicken is cooking, make your sauce. In a small bowl, whisk together soy sauce, red wine vinegar, agave, cornstarch, garlic, ginger and sesame oil until combined. Set aside. Once the chicken is browned, add the broccoli and stir to combine. Continue cooking for an additional 3 minutes, until the broccoli is bright green. Stir in the soy sauce mixture, and cook for an additional 1 minute until the sauce has thickened. Remove from heat and serve immediately, garnished with toasted sesame seeds. Posted on June 25, 2015, in Recipes, Vegan Life and tagged beyond meat chicken, broccoli, Dinner, vegan chicken, vegan chicken and broccoli, vegan dinner. Bookmark the permalink. Leave a comment.